Selex ES provides a complete range of Remote Monitoring and Control solutions engineered to end-users’ requirements. Selex ES can provide scalable solutions utilizing a wide variety of link technologies including legacy copper twisted pair, fiber optic, wireless, Sat-Com, and TCP/IP based networks. Selex ES Remote Monitoring and Control equipment can be deployed in a multi-tier network to provide regional or country wide monitoring at centralized maintenance centers in support of local airport operations. The Selex ES Model 2238 RCSU has the ability to monitor and control all ground navigation equipment, such as ILS, VOR, DME, TACAN, as well as other airport systems. The Selex ES Model 2238 RCSU combines a fully functional Air Traffic Control tower cab-mounted display system with the most advanced remote maintenance capability, including remote adjustment of Navaid parameters not previously available in the industry. Combined with the Remote Status Monitoring System (RSMS) software, the user has the ability to manage an entire network of systems countrywide. The Selex ES Model 2238 RCSU was designed to reduce operational costs by improving Air traffic Controller and maintenance technician efficiency. The Selex ES Model 2238 RCSU can be equipped with a touch screen and is equipped with a LCD display with a color, graphical layout of the airport, which can be either a simple bitmap or one enriched with pertinent runways and taxiways. Superimposed on the display are color coded icons representing navigation aids in their respective locations on the airport. An audible alarm is triggered in the event of an alarm or alert condition at any of the navigational aids. This advanced display reduces the controller workload by providing at-a-glance real time status of the associated equipment. Air Traffic Controllers can also control individual Navaids by touching the appropriate equipment icon on the touch panel screen to display a more detailed status and control panel for that equipment. 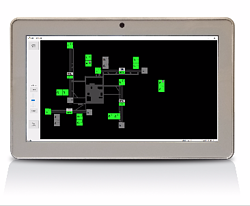 The controller can easily and securely change the selected approach end of any of the runways. The Selex ES Model 2238 is available in a range of COTS and customized COTS configurations targeting 19” rackmount or desktop installation. The optional Selex Model 2238 Remote Status Display Unit provides the same graphical map-based user interface to the associated navigation equipment as on the Selex Model 2238 RCSU. The RSDU is the preferred interface for ATC situations requiring monitoring of multiple runways and approaches. RSDUs are typically installed at ATC locations, as well as at other points around the airfield requiring at-a-glance status of the associated navigation equipment. Any practical number of RSDUs can be connected to the Selex Model 2238 RCSU over a TCP/IP network connection. Several form factors are available, including large touchscreen LCDs, compact panel mount system, and notebook PC-based systems. As an alternative to the Selex Model 2238 RCSU, the Selex Model 2240 RCSU is designed for installations consisting of up to three Navaid stations. It incorporates an embedded microprocessor and integrated LED status indicators. An external battery unit provides battery backup operation in the event of an AC power failure. The Selex Model 2240 RCSU is designed for installation in a standard 1U equipment rack panel space, either in a control tower equipment room or in a tower cab.